A thinly constructed single frame mask made to improve visibiity and become more streameline. 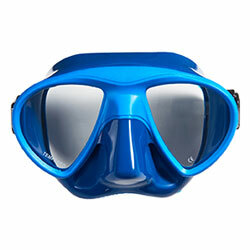 The teardrop design is made 1cm taller than conventional masks to increase visibility. 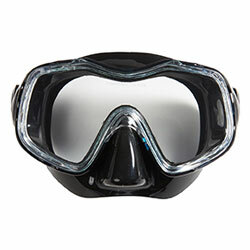 Many diving masks uses green tinted lens that distorts the clarity underwater due to the sunlight not being able to penetrate the lens properly. Our Mahalo masks uses the Ultra Clear Lens, a glass made for increased clarity and light absorbtion. Compare our lens to normal masks, and you can see the difference! Mahalo is desinged to fit asian individuals and wider faces due to the special shape of the silicone skirt. Made with soft & glossy silicone with special double skirting to prevent leaking and making on face. Different hardness used in certain areas to prevent masks from collapsing and hurting ones face due to water pressure. Easy adjustment of mask with our intuitive push button buckles.